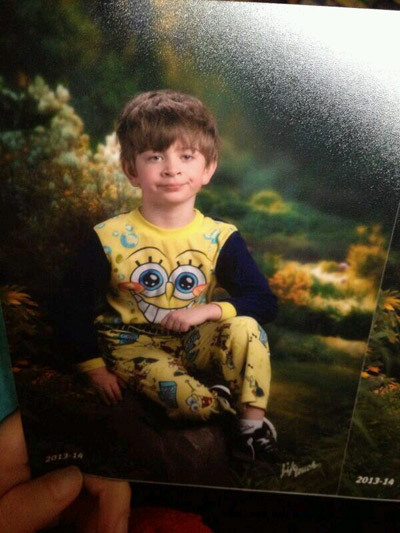 This kid’s school photo (shown above). I think we know exactly what happened there. Me Before You by Jojo Moyes. I stayed up until 2 a.m. to finish this book two days ago, and I’m still thinking about these characters. True Detective. We finally saw the first episode this week and proceeded to binge-watch the entire series. I still can’t get over Matthew McConaughey as Rust Cohle. Captain America: The Winter Soldier. I’m a sucker for these Avengers movies. This one would be better with 100% more Loki, but you can’t have everything. The Bugle Podcast #265: Cup ’em and Cough. “Technology’s Man Problem” (via The New York Times). These excerpts from Rob Lowe’s new memoir, Love Life . Patrick Stewart and Ian McKellan hanging out in New York. This story about how some bad (math-challenged) tippers made things right with their pizza guy. Winter is coming! Dragon eggs for everyone! Previous Post Whole30 Days 21-23: Oh, come on. Next Post Whole30 Days 24-26: Steak is the new pizza.